It's hardly surprising they were all lost for words: on the team's home ground, one of Formula One's smallest squads dismissed Ferrari, McLaren and all their other rivals to take a consummate victory from pole position in the Italian Grand Prix, thanks in large part to a sublime and extraordinarily mature performance by 21-year-old German Sebastian Vettel. There had always been so many question marks and caveats hanging over Vettel. He was clearly good, but had he made the same staggering impression as Robert Kubica when both were BMW test drivers? Had he really been that much of a step forward over Scott Speed when he joined Toro Rosso? Was he in the same class as the Kubica/Lewis Hamilton crowd? Was his burst of speed in mid-2008 due to an unfair rule loophole that allowed Toro Rosso to run an Adrian Newey-designed car with a powerful Ferrari engine? His Monza drive has answered a lot of those questions, and dismissed all of those doubts. Rain often brings shock winners, even Toro Rosso admitted that this was not the result they would have got on a dry weekend. But for other relatively recent surprise results, such as Olivier Panis' 1996 Monaco win for Ligier, Johnny Herbert's 1999 Nurburgring win for Stewart, or Giancarlo Fisichella's 2003 Interlagos win with Jordan, a perfectly-timed strategy call and/or a flurry of incidents that sidelined the usual front-runners played a massive part in the result. That wasn't the case with Vettel and Toro Rosso at Monza. Yes, his planned two stop strategy worked rather neatly with the need to switch from wets to intermediates for the final third of the race, and he was always on track at the right time in qualifying. 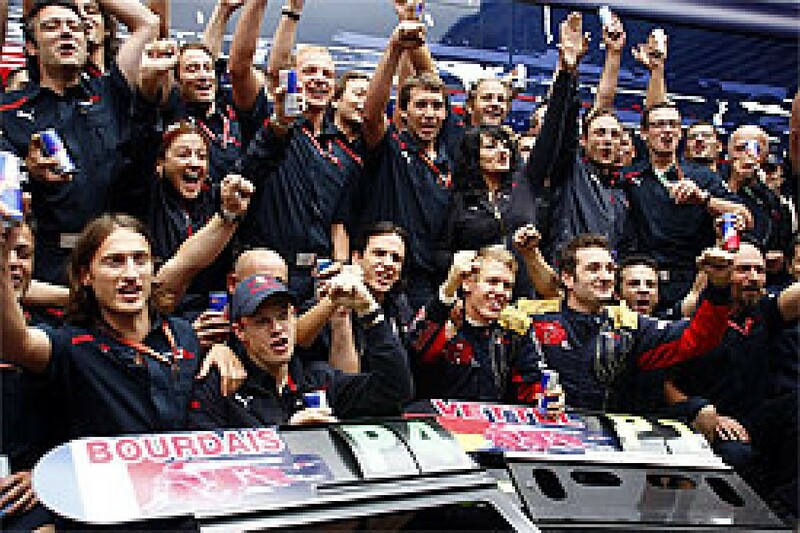 But unlike previous giant-killing winners, Vettel did it all from the front. He controlled the race throughout and had to speed to beat all his opponents. And it was all done using a largely dry set-up in often very wet conditions. Only Lewis Hamilton looked like being a genuine threat to Vettel's victory, and we'll never know what would have happened had both their strategies been allowed to run their course. But at worst, Vettel had second place in his pocket, and he could still have held off the championship leading McLaren to take the win. Given everything else he achieved this weekend, that seemed well within his capabilities. Indeed the only thing that seemed to tax Vettel at Monza was coming to terms with the enormity of his result. "Sometimes I was thinking there is still P1 on my board, how can it be?" he said. "It was difficult to realise what happened. I tried to focus all the time. Obviously I had quite a comfortable lead towards the end, so I could control it in the last couple of laps but I forgot all about being in the lead. When I crossed the chequered flag, I realised I had just won the race. It was unbelievable to see all the people going crazy around the circuit. "What a weekend. A perfect weekend. Pole position, race win, unbelievable. I don't know what to say really. "From where we started last year the team, the mentality has changed so much. "The atmosphere is fantastic. Everybody is extremely motivated. When I jumped in the car before the race everybody said 'ok, now destroy them or push like hell.' All the guys were joking and were happy and looking forward. "In that sense you could say we had the balls to do it today." Opening practice began in the damp, and ended in a virtual monsoon - with the pitlane awash as drains overflowed and water began seeping into the garages. That led to the session being abandoned four minutes early, although the red flag was somewhat academic for everyone had long since pitted as standing water spread across the circuit. With few having bothered to participate in the relatively pleasant first part of the session, the morning ended with Adrian Sutil and Giancarlo Fisichella's Force Indias first and third, split by Honda's Rubens Barrichello, and all three of them nearly four seconds clear of fourth-placed Timo Glock. The Toyota driver was the fastest of those to only run in the wetter part of practice. The McLarens, BMWs and Mark Webber all sat out the whole session, while Kazuki Nakajima also failed to set a time after had a spectacular spin into the Ascari gravel trap on his first run. After the track dried following a pre-session shower, the weekend's sole period of dry running came on Friday afternoon - and gave a hint of what might have been as Kimi Raikkonen, fresh from the announcement of his two-year Ferrari contract extension, went fastest and pronounced himself full of confidence for the rest of the Monza event. 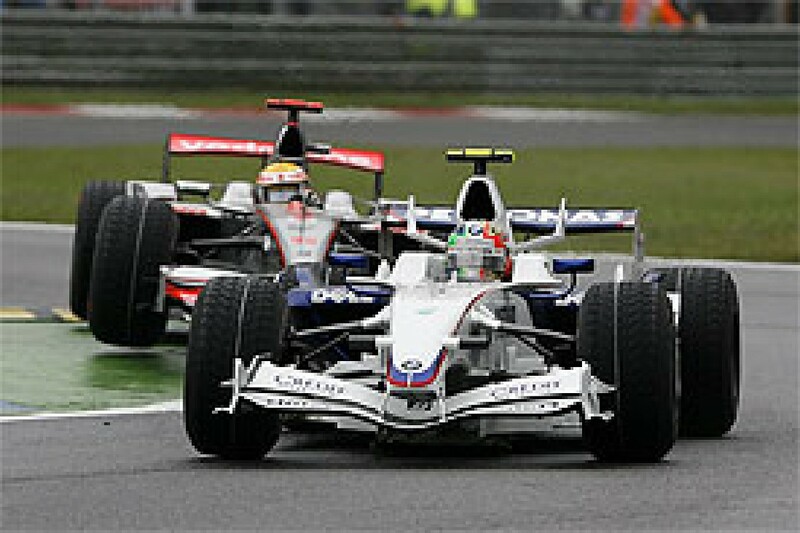 The BMWs took close second and third places, with Robert Kubica just ahead of Nick Heidfeld. Title rivals Lewis Hamilton and Felipe Massa were fourth and sixth, split by Williams' Nico Rosberg. The Renaults languished in 18th and 20th - Nelson Piquet slowest of all after spinning and beaching his car on the Rettifilio kerbs. The rain returned with a vengeance on Saturday morning, and it was Timo Glock who mastered conditions best to set the fastest time by 0.6 seconds over Sebastian Vettel. As had been the case the previous morning, all the rapid lap times were set early on, as the rain then increased and rendered the rest of the session rather redundant - although with the weather set to be turbulent all weekend, many still headed out for some rain mileage. Proving just how much conditions had deteriorated, Hamilton waited until the final part of the session before setting a time, and ended up last of all, over 10 seconds off the pace, and he was joined at the foot of the list by teammate Heikki Kovalainen and Raikkonen's Ferrari. Despite the rain still being a major factor come qualifying, there was a surprising lack of surprises in Q1, with both Hondas, perennial qualifying strugglers Nelson Piquet and Kazuki Nakajima, and Adrian Sutil's Force India all knocked out. For the latter this was particularly disappointing. Having starred in the wet so often, been fastest in opening practice, and seen his teammate Giancarlo Fisichella reach Q2, Sutil certainly didn't expect to be 20th and last again, 1.2 seconds slower than Fisichella. "The first set of tyres worked really well and we were very competitive but then I changed tyres and suddenly we lost all the grip and I was about six tenths a lap slower in better conditions," said the puzzled German. 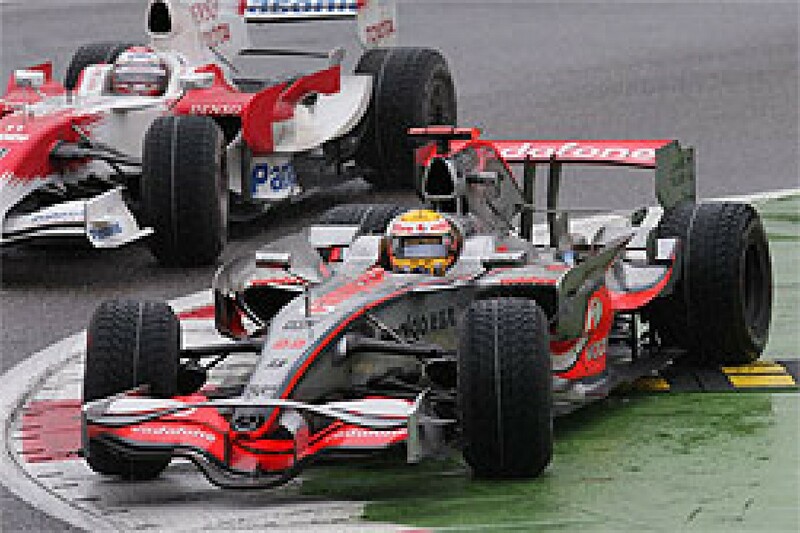 The results were similarly galling for Rubens Barrichello in 16th and Jenson Button in 19th- the former frustrated by a miscommunication that saw him sent out on fresh wets when he believed his previous set were coming up to their optimum performance, and the latter reckoning Monza wing levels and Honda's wet set-up simply didn't gel. Eighteenth placed Nakajima just "struggled to get a clear lap", while Piquet could be forgiven for only managing 17th when it took his teammate Fernando Alonso a few attempts to scrape through to Q2. "Since the start of the weekend, we haven't really been on the pace and I was expecting a difficult session," said Piquet. If Q1 had been low on shocks, then Q2 more than made up for that - with the most remarkable being that championship leader Lewis Hamilton only qualified 15th, 3.4 seconds off the pace and 1.8 seconds adrift of 14th. 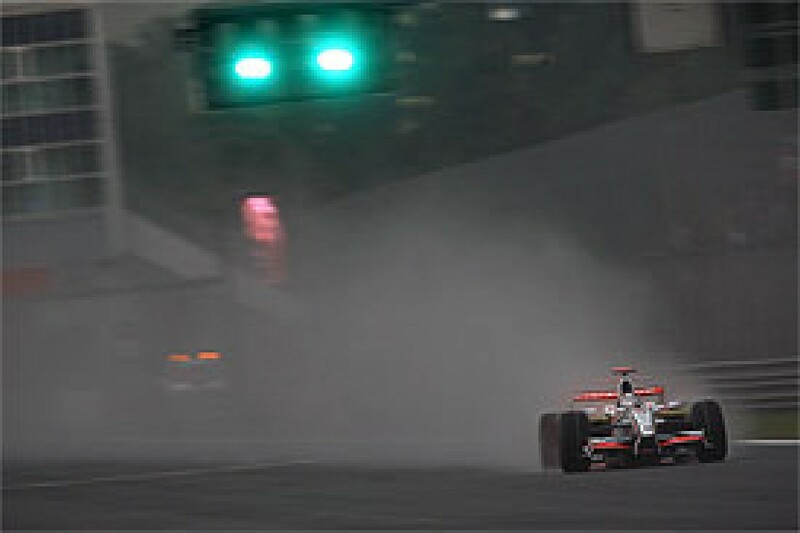 The McLaren driver had made the unique choice of going out on intermediate wets, and although a slightly drier line was starting to emerge, it was immediately obvious that he had been far too optimistic - especially as the rain then returned shortly after the start of the session. Hamilton was also delayed by a visit to the weighbridge, and simply couldn't get up to speed when he returned on extreme wets, not helped by a wild spin on standing water at the exit of the Ascaris. "I'd already glazed my brake on the first lap I did out and I couldn't get the temperature back into them. And I couldn't keep the temperature in the tyres," Hamilton explained. He wasn't the only big name to be embarrassed, with Kimi Raikkonen only qualifying one place ahead, and Robert Kubica missing the cut in 11th. Both joined Hamilton in spinning on the Ascari puddle, and simply failed to get a lap time in before the rain intensified. "I'm going to try hard here - I scored my first win in similar conditions in Brazil with this team, and although that's going to be difficult here, we can at least try for points," he said. With only one Ferrari and one McLaren left in contention, Q3 would normally have come down to a Felipe Massa versus Heikki Kovalainen battle. But although Kovalainen grabbed the outside front row spot, he was beaten to pole by a remarkable performance from Sebastian Vettel, as Toro Rosso's young German bolstered his 'rain-master' reputation by becoming the youngest ever pole-sitter, and the first man to lead the grid for STR. "I was joking with my engineers: we were saying if it is wet, then we have to go for pole position and... unbelievable," said the delighted 21-year-old. "When you feel confident in these conditions, it is a huge advantage. I think that is the key because if you don't know how your car is reacting, then obviously you are not trying." "I set the time quite early. I was lucky to get a clean lap and I put it all together in this lap and then towards the end of the session there was more and more rain, so the people waiting more and more to go out had a bit of bad luck." Kovalainen agreed that timing had been key, having missed pole by just 0.076 seconds. "It was very close with Sebastian and I just missed the beginning of the session," said the Finn. "My first lap wasn't quite as good and then it started to rain a little bit towards the end of the session. In the last lap I tried to have another go but the grip level was fading away." Of the few men who did manage to improve was Red Bull's Mark Webber, who grabbed third with his last lap - pushing Vettel's Toro Rosso teammate Sebastien Bourdais back to the outside of row two. "At the start of Q3 I had a little bit too much spray to pick my braking points in the first two chicanes," Webber said. "I stuffed the second one up and the guys said it is going to rain heavier, so I thought I haven't done a great job here in Q3. But I managed and my last lap actually was my best." While his teammate was the centre of attention, Bourdais graciously accepted his career-best fourth on the grid. "It was a bit crazy out there," he said. "Seb pulled out a great lap and pole is fantastic for him and the team and so is having both cars on the two front rows. I was third for a moment, but I'm not complaining." Nico Rosberg was thrilled to claim fifth for Williams in what would turn out to be the fastest of the one-stopping cars, with Massa managing no better than sixth - although that still put him nine places ahead of title rival Hamilton. "To be honest, it could have been better but it could have been much worse," said Massa, who took his one permitted 'joker' engine change after the session. "I missed doing a great lap, but it was so difficult in those conditions to do a perfect lap." Toyota were the only team to get both cars into the top ten - Jarno Trulli and Timo Glock sandwiching Alonso in seventh and ninth - with Nick Heidfeld completing row five alongside his compatriot, as four of F1's five German drivers reached Q3. There was no respite for the drivers on race day as Sunday also dawned wet, and another huge downpour struck as they lined up on the grid. At least that meant there would be no dilemma on tyre choice: extreme wets were the only sensible option, especially once it was confirmed that the race would begin behind the safety car. Two laps were ultimately run under yellow, but by that time there had already been heartbreak for half of the Toro Rosso line-up, as Sebastien Bourdais stalled on the dummy grid and had to join the race one lap down. "When I tried to get first I couldn't and so then I let go of the flipper a bit quickly and when the gear selected I stalled, when normally the anti-stall should have come in," he explained. "Then we couldn't get neutral and that was it." No such problems for teammate Sebastian Vettel, who expertly handled the rolling start, then stormed away from the field in the early laps, out-pacing Heikki Kovalainen by 1.5 seconds for the first two laps before the Finn stabilised the deficit at around five seconds. "The safety car helped me and being first and having no visibility problems at all was the key and I could make quite a good solid gap of about six to seven seconds to Heikki straightaway," said Vettel, who survived a few slides and trips over the kerbs. "I was pushing very hard and sometimes went a bit over the limit and nearly lost the car as it was so difficult at the start as there was a lot of water." Kovalainen had no answer for Vettel in the first stint, as that initial six-second gap gradually grew to around 10 seconds. "I had a little bit of a problem, especially with the extreme wet tyre and some problems also to warm up my brakes, so I was just struggling to find more time," said the McLaren driver. Third-placed Mark Webber kept Kovalainen just about in sight at first, while easily pulling away from Nico Rosberg, as the Williams struggled to fend off Felipe Massa's Ferrari. "I thought I should be able to maintain a good pace, but I really struggled with tyre degradation and I lost time to those in front of me," said Rosberg. But that didn't stop him trying his utmost to resist Massa. They ran side by side through the first chicane and right around to the Roggia on lap 12, with Massa getting ahead on the outside line, but having to use a tiny amount of the run-off to complete the move. 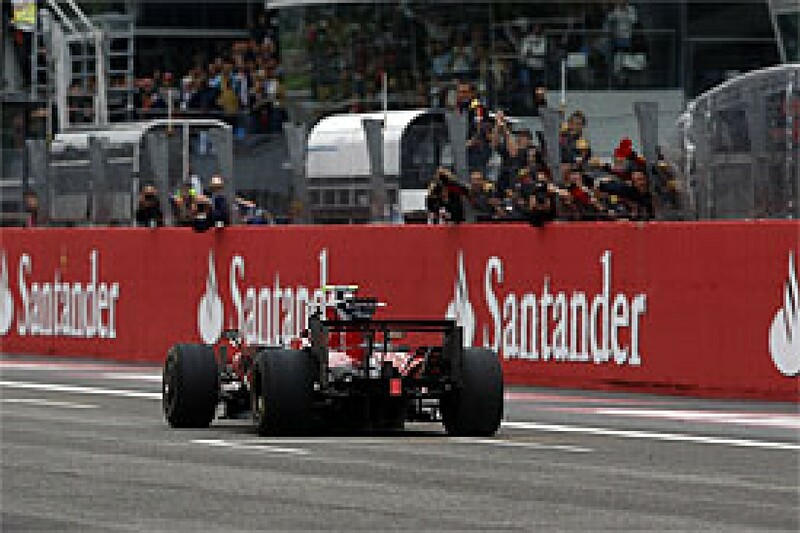 In the current (post-Spa controversy) climate, Ferrari asked him to let Rosberg back past, meaning it would be another lap before he could take fourth more permanently with a move on the front straight. By this time Hamilton was also making assertive progress. He had been a low-key presence at first, staying in 14th place, close behind Giancarlo Fisichella and Kimi Raikkonen. But once both Raikkonen and Hamilton had finally passed the Force India on laps eight and nine, Hamilton moved up a gear. "I took it easy at the beginning, and then started to close everyone down, and pulled off some good moves when I needed to," he said. Raikkonen was his next target, and with the Ferrari overtaken into Lesmo 1, Hamilton then caught and passed Nick Heidfeld, Timo Glock, Robert Kubica, Fernando Alonso, Jarno Trulli and finally Rosberg on lap 23. Most of these moves were straightforward slipstreams down the pits straight, with only Glock able to fight back - the Toyota drawing back alongside on the exit of the first chicane and being edged onto the Grande Courbe grass as Hamilton took the racing line. His pass on Rosberg put Hamilton up to second place, for by that time the two-stopping Kovalainen, Webber and Massa had all made their first stops and emerged amid traffic behind the Briton, whose pace was all the more impressive given that he was on a hefty one-stop fuel load. Vettel had been the lightest of all the front-runners, pitting on lap 18 - four laps before Kovalainen. But the Toro Rosso's pace had been such that he was 11 seconds clear of Kovalainen by then and had no trouble maintaining his lead during the pit sequence. Hamilton was starting to loom in his mirrors, though. Once ahead of Rosberg, the McLaren was only five seconds behind Vettel, and within two laps that deficit was only a few car lengths. Before he had chance to attack the Toro Rosso, Hamilton came in for what he hoped would be his sole pitstop on lap 27. Like all his main rivals, he chose extreme wet tyres again, for although the rain had eased from deluge to occasional light showers, another substantial downpour was forecast to arrive imminently according to most teams' weather predictions. The promised cloudburst never came, though. And as drivers became ever more desperate to cool their wet tyres in puddles, it was clear that the extreme rubber wasn't going to make it to the end of the race. Rubens Barrichello had been the first to try intermediates when he gambled on a lap 16 change, but that succeeded only in dropping him even further down the order. David Coulthard made the switch 11 laps later, but then flew straight down the escape road at the first corner, indicating that perhaps grip was still in short supply. 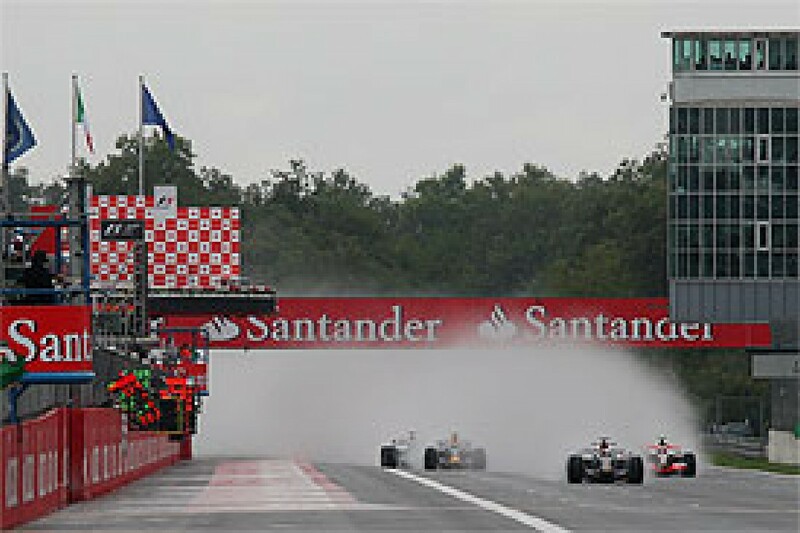 However when Alonso and Kubica, who had been struggling on the extreme wets and had both been overtaken by Glock, took on intermediates at their single pitstops and started lapping quickly on them, those still on full wets started having second thoughts - especially as the skies were finally clearing overhead. The timing was ideal for all the two-stoppers and for everyone on a long first stint one stop plan, but a disaster for early one-stoppers Hamilton, Glock, Trulli, Raikkonen and Rosberg, with the latter further hampered by a delay on the fuel hose during his pit visit. All would have to come in for an unwanted second stop within a handful of laps. While the weather fitted neatly with Vettel's two-stop strategy, it was also worth noting that he had maintained a stronger pace than most on fading extreme wets and actually waited until lap 36 before making his final stop and rejoining still nine seconds ahead of Kovalainen, who remained incapable of catching the Toro Rosso. 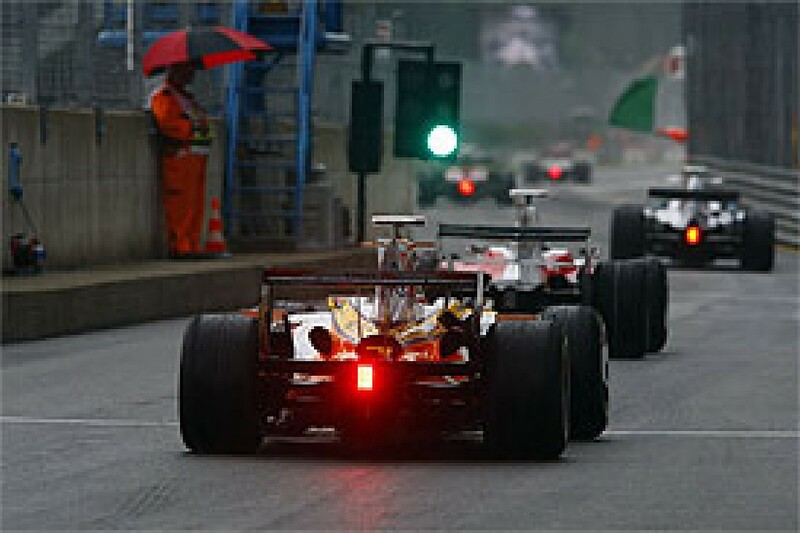 Kubica, Alonso and Heidfeld's well-timed intermediate switches had moved them up to third, fourth and fifth places, just ahead of Massa, who had got caught amongst the one-stoppers after his first pitstop and struggled to make progress. Rosberg, the Toyotas and Raikkonen would potentially have made this an eight-car group had they not been forced to pit again, sending all four tumbling into the midfield. Hamilton's extra stop dropped him to eighth, although he managed to overtake Webber almost immediately, the Red Bull driver having lost ground when he spun at the Ascaris while dicing with Massa following their final stops. Lapping faster than everyone else on track, Hamilton quickly closed in on Massa for sixth, but in doing so he demanded too much of his intermediate tyres, and soon found himself grip-less and back under attack from Webber, the pair escaping a frightening high-speed brush of wheels approaching the first chicane in the closing stages. Hamilton wasn't the only one struggling to keep his tyres intact as the track became ever drier, and the racing action fizzled out as drivers concentrated on nursing their rubber to the flag. 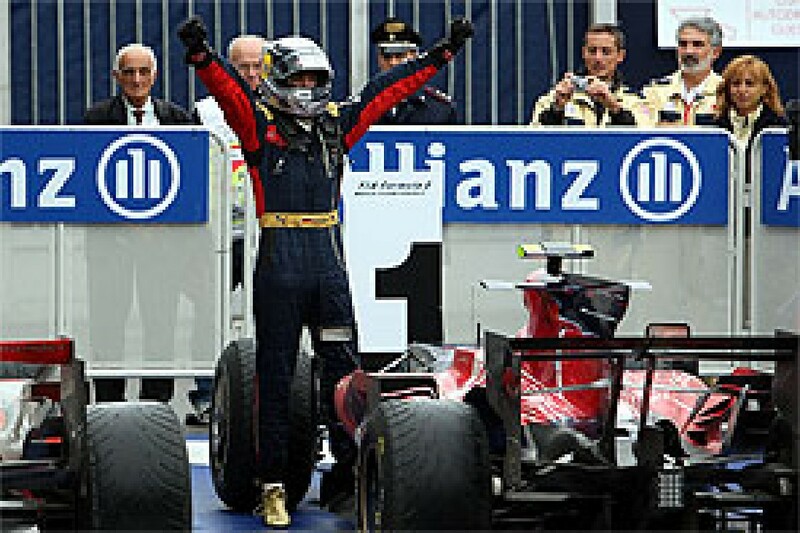 But one man who seemed impervious even to wilting rubber was Vettel, who continued to calmly extend his lead and claim his and Toro Rosso's first win, and the most surprising victory in many, many years, while also becoming the youngest winner in F1 history. "The lap back to the pits and the whole podium ceremony was just unbelievable," he said. "I think for sure this is the best day of my life. These pictures, these emotions, I will never forget. It is unbelievable. It is so much greater than you might think it is." The muted Kovalainen and the canny Kubica completed the podium, ahead of Alonso, Heidfeld, Massa, Hamilton and Webber - all relatively content to have survived the afternoon intact, but none of them remotely as jubilant as Vettel. Raikkonen didn't even make it into the points. Unable to match Hamilton's early charge through the field, his anonymous race finally perked up in the final moments, when he overtook Kazuki Nakajima and Nelson Piquet in quick succession and set the race's fastest lap by over a second as he fought through to ninth. "In the end the car was good again but we seem to have a problem to get the tyres working," said Raikkonen. "Once they switch on, it is okay. But if they don't work, then there is nothing I can do." Piquet used an enormous 36-lap opening stint to come through from 17th to 10th, allowing him to run as high as fourth and swap to intermediates at the right moment. Eleventh was a poor reward for Glock's pace all weekend, as Toyota's extra stops ruined their Monza afternoon and allowed Renault to draw level with them in the battle for fourth in the constructors. Glock and Alonso had earlier engaged in a spirited battle, with the German spinning at the Rettifilio but rapidly rejoining, then catching and re-passing the Renault. Nakajima, Trulli and Rosberg followed Glock home in a Toyota-powered quartet. Honda had another abysmal race, and even some bold tyre gambles failed to lift Jenson Button and Barrichello out of the midfield. Button stayed on worn extreme wets to the end and finished 15th, while after his hugely premature switch to intermediates, Barrichello changed to slicks with 10 laps to go and struggled to the flag in 17th, behind Coulthard, whose race was spoiled by brake balance and tyre wear issues, a trip through the Lesmo gravel, and a brush with Nakajima that left him in need of a new front wing. 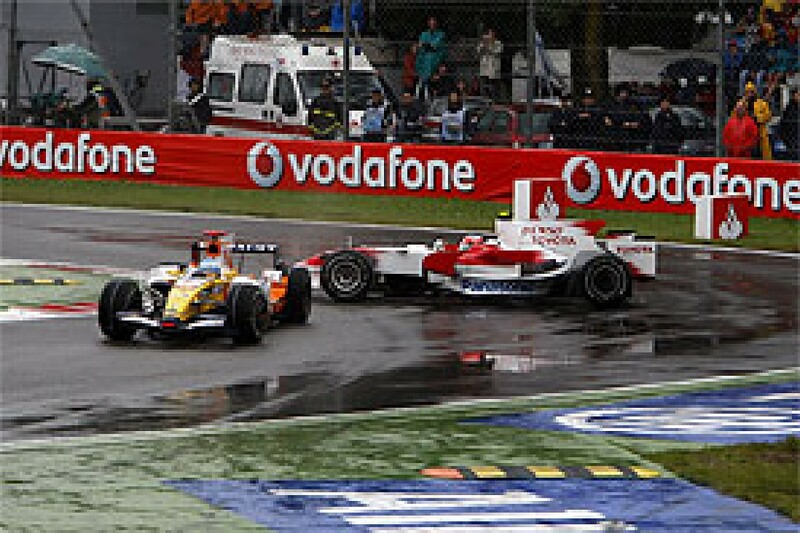 Remarkably given the challenging conditions, Fisichella was the race's only retirement, having skated into the Parabolica wall on lap 12 after his Force India's front wing was broken in a touch with Coulthard and then jammed under the car. Fisichella had hoped that he might be the underdog benefiting from the weather to pull off a shock result in Italy, but that honour was all Vettel's. It was a shame that Bourdais didn't get to share in it, though. His pace once he joined the race - including the second-fastest lap - proved that he could certainly have been a factor in the podium fight, but instead he finished a lowly 18th. "It's very difficult to enjoy it with the team in these conditions," Bourdais said. "I'm very happy for them but my race was a non-event. "It looks like we were pretty much set for third place. I don't know if we could have set as good a pace as Sebastien Vettel, and I don't want to sound pretentious, but we would have been pretty close..."
Raikkonen is announced as a Ferrari driver through 2010, then proceeds to top Friday afternoon practice and declare that he is confident of a strong weekend come rain or shine. But in the event, he struggles to 14th on the grid and ninth in the race, having struggled to get his tyres up to temperature in the wet all weekend. Massa qualifies sixth, takes his 'joker' engine change for race day, fights up to fourth early on, but emerges in traffic after the first of his two stops and therefore loses ground. Eventually comes home sixth. Heidfeld and Kubica are very quick in the small amount of dry practice time, but mis-time their qualifying runs and have to start 10th and 11th. Kubica passes Heidfeld on the opening lap but didn't even see his teammate in the spray. On heavy fuel loads, they run quiet races in the lower top ten group at first, but perfectly timed pitstops for intermediates vault them up to third and fifth by the end of the race. 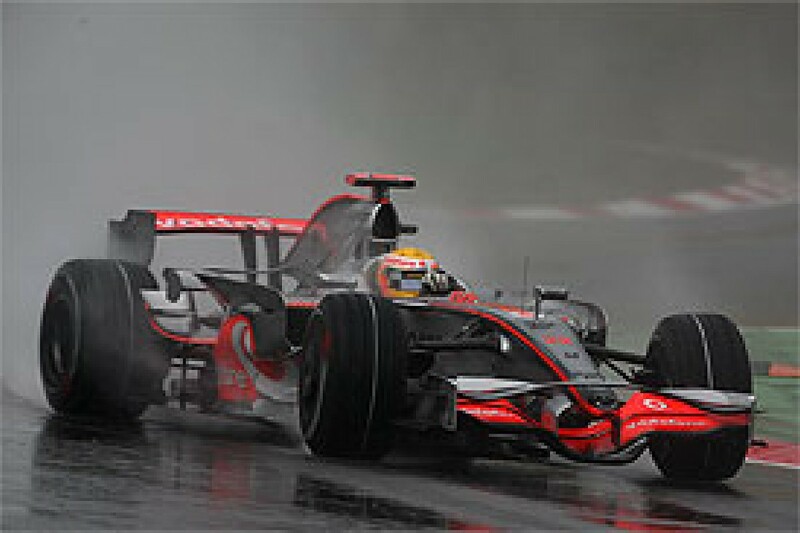 Alonso qualifies eighth and struggles for speed as his wet tyres wear out. But switching to intermediates at his pitstop revitalises his race and allows him to grab fourth place. Piquet spins and gets stuck on a kerb in Friday practice, then qualifies a disappointing 17th. A huge fuel load helps him progress in the race, and having run as high as fourth, he eventually finishes 10th. Rosberg is very rapid in practice then takes fifth on the grid, ahead of Massa's lighter Ferrari. He can't maintain the same pace in the race and has to let the Ferrari go after a spirited early battle. Later loses a lot of ground having to make an unplanned extra stop for intermediates, leaving him a frustrated 14th at the flag. Nakajima spins off on Friday morning, qualifies a poor 18th and starts from the pitlane, but comes through to a more respectable 12th. A superb late lap earns Webber third on the grid, and he holds the position early in the race. Emerging in traffic after his first stop and then spinning while dicing with Massa just after his second cost him ground, though. He then comes off second best in another tight tussle with Hamilton at the end and has to settle for eighth. Coulthard qualifies 13th and finishes 16th, having been off the road and broken his front wing in a tangle with Nakajima. Glock tops Saturday morning practice and the team are the only one to get both cars into Q3, with Trulli taking seventh, two places ahead of his teammate. They show strong pace early in the race and make good progress through the top ten on one stop strategies, despite Glock having a quick spin while dicing with Alonso. But when the track dries just after their one scheduled stop and both have to pit again for intermediates, they fall back to 11th (Glock) and 13th (Trulli). A remarkable weekend for Vettel, who takes pole and then commands the race from the front, edging away from all rivals to claim a historic and almost unthinkable victory. Bourdais shows similar pace, qualifying fourth on a slightly heavier fuel load, but stalls on the dummy grid and has to start a lap down. Sets the second-fastest race lap on his way to a desperately frustrating 18th. Another poor weekend for Barrichello and Button, who can only qualify 16th and 19th in weather conditions where they have so often thrived in the past. Whatever they try in the race is to no avail: Barrichello makes a very early move to intermediates and even tries slicks at the end, but finishes 17th. Button makes set-up changes and starts from the pitlane, then stays on wets till the end, and can only finish 15th. Sutil and Fisichella time their laps well in first practice and take first and third, then also show very promising pace in the dry parts of practice. Fisichella makes the team's first Q2 appearance and qualifies 12th, but there's no giant-killing for Sutil, who starts last. In the race, Fisichella puts up a spirited defence against Raikkonen and Hamilton at first, but crashes out after damaging his front wing on Coulthard's Red Bull and then going off on his own debris. Sutil makes little headway in the race and finishes 19th after a late and unsuccessful switch to dry weather tyres. Hamilton condemns himself to 15th on the grid after gambling on intermediate tyres on a very wet track in Q2 and then failing to get up to speed on the appropriate rubber. He then makes up for that error on race day with a gallant charge towards the front on a one-stop fuel load. Second place - and possibly a win - looks certain until the promised second rain shower fails to appear when forecast and forces Hamilton to make an additional stop for intermediate tyres. That drops him to seventh, where he remains having worn his tyres out while chasing down title rival Massa. Kovalainen becomes McLaren's main hope after qualifying a close second, but he simply cannot match Vettel's pace in the race and takes a disappointing runner-up spot. Pre-race: Felipe Massa underlines how slippery conditions are with a big slide during one of his reconnaissance laps. Jenson Button and Kazuki Nakajima are still in their garages at 13.45 hrs and will start from the pit lane. 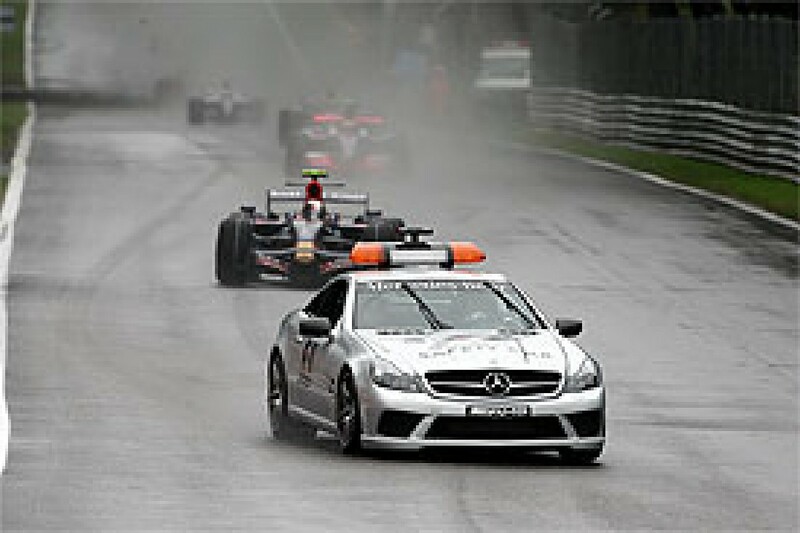 Lap 1: Safety Car start. Sebastian Vettel - a first pole position for both the German and Toro Rosso - leads away from Heikki Kovalainen, Mark Webber, Nico Rosberg, Massa, Jarno Trulli, Fernando Alonso, Timo Glock, Nick Heidfeld, Robert Kubica, Giancarlo Fisichella, David Coulthard, Kimi Raikkonen, Lewis Hamilton, Rubens Barrichello, Nelson Piquet, Adrian Sutil, Button and Nakajima. Sebastien Bourdais, fourth in qualifying, stalls on the grid. He starts one lap behind. Lap 3: Race starts. Vettel pulls 2.0 seconds clear. Glock passes Alonso. Kubica passes Heidfeld. Lap 4: Alonso repasses Glock. Raikkonen and Hamilton pass Coulthard. Button passes Sutil. Nakajima passes them both. Lap 5: Vettel posts a 1:33.151 to lead by 5.2 seconds. Lap 7: Vettel gets sideways at Turn Five and vaults the kerbs. Glock spins at Turn One and drops from eighth to ninth. Raikkonen and Hamilton are very close to each other, behind Fisichella who lies 11th. Lap 8: Vettel laps in 1:34.972. He leads by 6.3 seconds. Lap 9: Raikkonen passes Fisichella into Turn One. Lap 10: Vettel leads by 6.6 seconds. Hamilton passes Fisichella at Turn One. Lap 11: Hamilton passes Raikkonen for 11th. Lap 13: Massa passes Rosberg into Turn One but loses out at the exit. He misses the apex of Turn Six, takes fourth but gives the place back. Fisichella bangs his front wing on Coulthard's rear wheel at Turn One. It subsequently breaks and the Italian slides off the road at Turn 11 to retire. 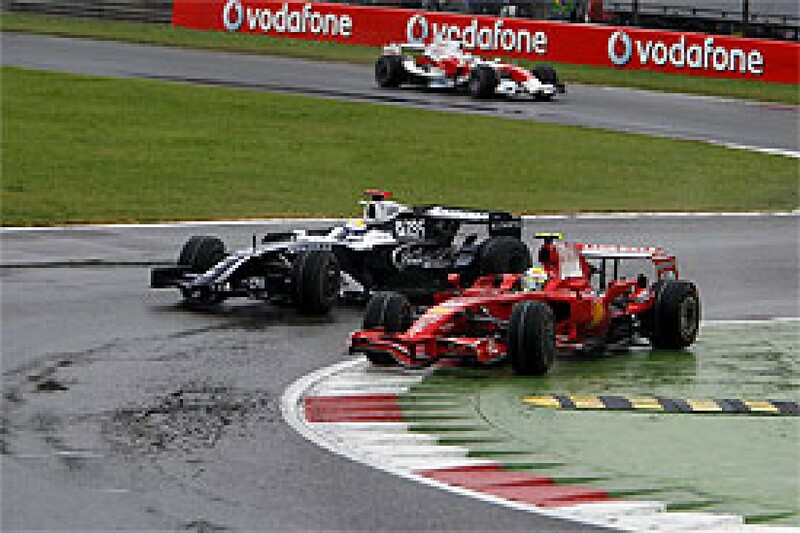 Lap 14: Rosberg repasses Massa. Hamilton passes Heidfeld. Lap 15: Massa gets ahead of Rosberg once more, at Turn One. The Brazilian laps in 1:34.955, the race's best yet. Lap 16: Massa laps in 1:34.950. Hamilton passes Glock. Barrichello pits. Lap 17: Hamilton passes Kubica. He now lies eighth. Lap 18: The leader pits and drops to fourth. Kovalainen leads from Webber. Massa posts a 1:34.789. Lap 19: Hamilton passes Alonso at Turn One. Glock passes Kubica. Lap 20: Massa goes faster again: 1:34.457. He is 11.0 seconds behind Webber. Lap 21: Glock passes Alonso. Lap 22: The top three all pit, as do Button and the lapped Bourdais. Vettel leads. Hamilton passes Trulli into Turn One but misses the apex of Turn Two and gives the place back as they exit the corner. Lap 23: Hamilton passes Trulli. Lap 24: Hamilton passes Rosberg. He's now second on the road, 3.7 seconds behind Vettel. Raikkonen passes Heidfeld. Lap 25: Fastest lap to Hamilton: 1:34.324. He trails the more heavily fuelled Vettel by 1.7 seconds. Glock pits. Lap 26: Hamilton cuts his arrears to 1.1 seconds. Trulli, Raikkonen and Sutil pit. Lap 27: Hamilton pits and drops to 10th. Lap 28: Vettel leads Kovalainen by 12.4 seconds. Rosberg and Coulthard pit. Lap 29: Heidfeld pits, as does Bourdais (still one lap down). Raikkonen passes Glock. Lap 30: Alonso pits and comes out on normal wets. Lap 31: Raikkonen passes Trulli. Nakajima pits. Lap 33: With 20 laps to go, Vettel leads Kovalainen by 11.8 seconds. Massa, Glock and Rosberg all pit. Lap 34: Kovalainen, Kubica and Webber pit for normal wets. Lap 35: Webber spins at Ascari. Raikkonen and Trulli pit. Lap 36: Vettel pits and rejoins with his lead intact. Hamilton and Piquet pit, too. Massa laps in 1:33.601. Lap 37: Vettel leads Kovalainen by 9.5 seconds. 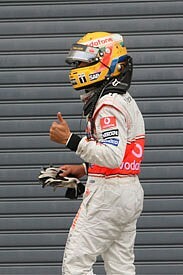 Kubica, Alonso, Heidfeld, Massa, Hamilton and Webber complete the top eight. Sutil pits and spins at the first chicane upon rejoining. Lap 38: Hamilton laps in 1:32.869 - 1.5 seconds quicker than Vettel. Lap 39: Piquet passes Button. Lap 40: Kovalainen reduces his arrears to 10.8 seconds. Massa passes Heidfeld at Turn One but misses the apex of Turn Two and gives back the place immediately. Lap 41: Vettel extends his lead to 11.3 seconds. Lap 43: Piquet passes Coulthard. Raikkonen and Glock pass Nakajima. Barrichello pits. Lap 44: Fastest lap to Raikkonen: 1:32.733. Lap 45: Raikkonen laps in 1:32.595: he passes Coulthard. Lap 46: Kubica laps in 1:32.366, Webber in 1:32.014, Raikkonen in 1:31.691. Lap 48: Raikkonen passes Piquet. Lap 49: Webber and Hamilton brush wheels as the Australian tries an outside pass at Turn One. He slithers down the escape road, then allows Hamilton back ahead. Raikkonen laps in 1:29.844 - almost two seconds quicker than the leader. Glock passes Coulthard. Lap 50: Coulthard and Nakajima touch at Parabolica. The Scot pits for a new nose. Lap 51: Raikkonen laps in 1:29.649. Lap 52: Raikkonen posts a 1:29.164. Lap 53: Vettel becomes the youngest world championship grand prix winner, finishing 12.5 seconds clear of Kovalainen. Kubica is third from Alonso, Heidfeld, Massa, Hamilton and Webber. Raikkonen sets another fastest lap: 1:28.047.